For decades after the arrival of commercial television in Australia in 1956, subscription services had been prohibited by law. 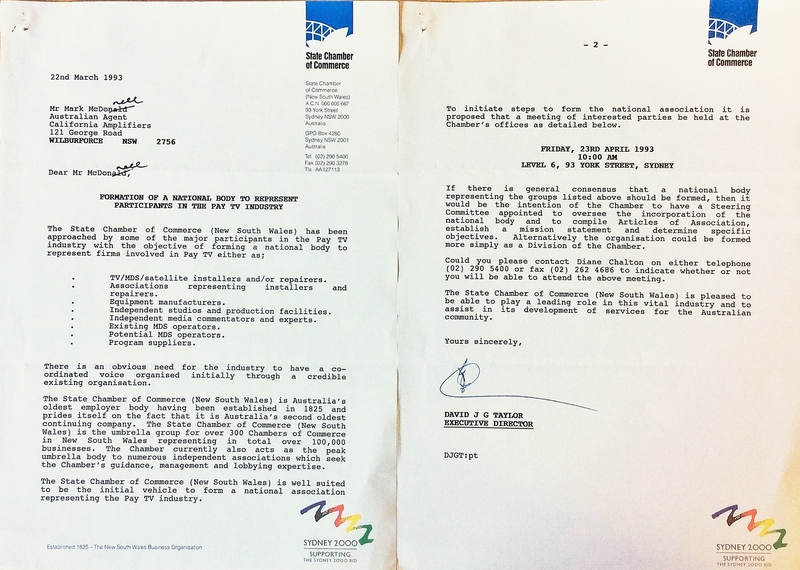 In 1992 the ban, which had protected free-to-air television from competition, was lifted by the Keating Government to boost competition and consumer choice. Prompted in part by moves in 1993 by the NSW Chamber of Commerce to establish a representative body, the industry came together under twin representative organisations, the Federation of Australian Narrowcasting Subscription Services (FANSS) led by consultant Mark McDonnell under the chairmanship of Barney Blundell, and the Confederation of Australian Subscription Television (CAST). These organisations were the antecedents of the modern ASTRA. By 1994 Telecom began unrolling its national network, then costed at $400 million, only to be matched by arch competitor Optus Vision in Sydney, Melbourne and Brisbane, in an enterprise later described as a ‘misadvanture’ by an Optus chief executive. The erection of duplicated overhead cables in some metropolitan areas became a flashpoint for local communities and was later lamented as wasteful. It was not until Australia Day 1995 that the nation’s first subscription provider, Galaxy, began broadcasting with two operational channels, the local Premier Sports channel and international news outlet ANBC. At its peak, Galaxy attracted some 120,000 subscribers before a parent, Australis, went into liquidation in 1998. In October the same year, Foxtel, a joint venture between Telstra and News Corporation, began delivering a 20 channel service. Soon 1995 Optus Vision and Austar joined the industry, providing consumers with choice they had never known before. 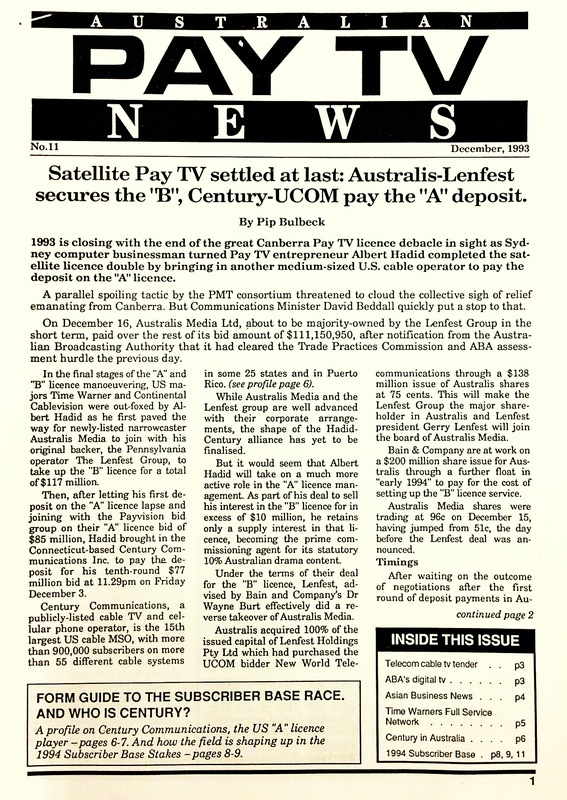 An early edition of Australian Pay TV News.